The Diamond Club is our most exclusive jet card and ideal for the frequent fliers, those who fly 50 hours or more. 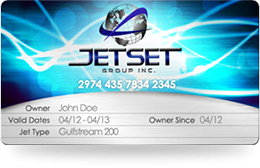 The Diamond Jet Card is the ultimate in jet membership providing more benefits than any other card in private aviation. Diamond Cards offer our lowest guaranteed hourly rates on every aircraft from Turbo Props to Heavy Jets. Diamond Club members have exclusive access to our database of empty legs. Hours can be used in the continental United States, Mexico, Caribbean, Canada and parts of Europe. JetSet Group Inc understands that each customer has different aircraft travel requirements. That’s why we’ve created two convenient and flexible flight card options for you to choose from. Both programs offer ease of transaction, expedited service and complimentary standard catering. Card members enjoy the benefits of our one-on-one concierge service for booking everything from specialty catering to ground transportation and hotels. The JetSet 25 Hour Card is ideal for the established flier who has a specific preference in aircraft and frequently travels by private jet. Pay a set hourly rate that’s all inclusive. No fuel surcharges, landing fees, repositioning charges or taxi time, and hours are only deducted for point-to-point flight time. Lock in Pricing Now - even if fuel or charter costs rise, your price will not change. Option to Upgrade or Downgrade Aircraft within category and pro-rated ratio to calculate hours. The JetSet Universal Access Card is ideal for those who only fly 5 or 6 times a year or who generally travel commercial but would like to try using a private charter jet. This is also an excellent program for those who are required to transfer funds from out of the US when paying for a charter, or who want the convenience of making last minute travel plans. The Universal card provides a variety of first-class services and privileges that make your travel as comfortable and relaxing as possible. When you purchase a Universal Access Card you save both time and money. The transfer of funds to secure a plane in foreign countries can take as long as 24 to 96 hours. Not only is this a costly expense in time, but the delay can make it difficult to secure the best priced jet for your trip. Charter prices can vary as much as 15% to 20%, that’s why it’s important to have your funds available when you need them. The Universal Card works like debit card. You put a minimum of $25,000 into your account, and these funds are available immediately when you need them. Complete Flexibility – You are not locked into any one aircraft or category of aircraft. Less Paperwork – One signature and you are in the air. Complimentary Upgrades - With a minimum account of $100,000. One of the Lowest Entry Amounts in the Industry. How many hours do you usually fly in a year?